NaviTrack II locators provide unprecedented ease-of-use for locating underground pipes. NaviTrack II’s advanced technology greatly reduces training time. You can learn to locate with NaviTrack II in minutes. Locates SeeSnake in-line transmitters, remote transmitters (sondes), and energized metallic lines. Transmitters can be approached from any direction for faster, more accurate locates. Locates can be easily verified using the large mapping display. Power Source 4 C-Cell batteries. Sonde 16 Hz, 512 Hz, 640 Hz, 850 Hz, 8 kHz, 16 kHz, 33 kHz. Active Line Trace 128 Hz, 1 kHZ, 8 kHz, 33 kHz, 262 kHz. Passive AC Line Trace 60 Hz, 50 Hz. NaviTrack II Locator is rated 5.0 out of 5 by 3. Rated 5 out of 5 by ColoradoContractor from Simple, highly-accurate multi-purpose locator This is another great hi-tech piece of gear made by Ridgid. Let me tell you, I have located water lines, electrical lines, sewer lines, and gas lines all with this tool and/or induction clamp, Brick transmitter and integrated sonde on a SeeSnake Compact2. Phenomenal! You have to see it in action to believe it. This locator is a Top 10 item on my truck and for good reasons: safety and productivity. The accuracy and information this tool provides is priceless. Used in conjunction with an integrated camera sonde...it puts you not just right over the action, but right on it. Knowing how deep to dig (or not dig!)? Priceless. Some of examples of recent work where this was critical in planning and preparation: building a massive retaining wall directly over neighborhood electrical service plus gas line tracing. Tracing gas lines for installing sprinklers. Location for removal of 90-feet of sewer lines from underneath a basement floor. Locating more gas lines for running drainage and sewer lines. 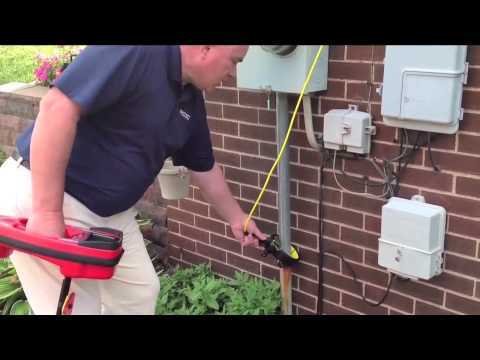 Electrical line discovery and locating. (general 60-Hertz sweeping). And yes, I was able to find/located services that weren't previously known or weren't where they were supposed to be! It's well built, has crystal clear display in bright or dark light, durable and easy to operate. Batteries are easy to service and the folding arm is brilliant. It's a very technical device but yet intuitive. It's simple to setup and change frequencies. Instructions and DVD are thorough and very helpful. The included case keeps everything altogether including accessories:. I have the Brick, induction clamp, extra batteries and the unit itself all together. Fantastic design and package. Bottom-line: If your company will benefit like mine from solid technical gear like this, look no further. I highly recommend the NaviTrack II Locator. Rated 5 out of 5 by DrainRiteNY from Great Product - Fantastic Accuracy This is one of the best locators on the market in my opinion. The pinpoint accuracy of location and depth is second to none. Without this locator, my job would be ten times as hard. My father always told me to work smart not hard and this tool is one of the smartest, if not "The Smartest Tool"on the market. Thanks Rigid for making this must have locator that has quickly become my immediate "go to" tool for locating and depth finding of pipes and much more! I highly recommend the Navitrack II Locator! Rated 5 out of 5 by jasontheplumber from great product for the professional spot on accuracy for locating underground. this is not a product that you're ready to use right out of the box in minutes it takes some time to learn because of all the features it has to offer.